Very glad to introduce this module to our ever growing line of products. .Two independent filters, a High-Pass and a Low-Pass with dedicated audio inputs and outputs. .Besides individual outputs the HP and LP are also sent to a voltage-controlled Mix between the HP and LP filters. .Both Cutoff and Resonance are voltage-controlled with dedicated cv attenuator pots. .Switch for selecting between normal cutoff behaviour and an adjustable Smooth circuit to simulate a vactrol behaviour for cutoff control. .Switch for setting filters Filters in Parallel (independent) or Series (HP > LP). .Inspired by the Oscar synthesizer we added a Coupling switch to tie the HP Cutoff control to the LP Cutoff control, in this case the LP cutoff controls act as an offset from HP setting. .Three position switch selects different resonance clipping paths: diodes / no clipping / leds. .Both filters features a post Distortion/Fuzz circuit that adds extra harmonics adds an even deeper growl or extra gritiness to it. .All audio outputs (HP, Mix, LP) feature a switch for choosing phase output, allowing additive or subtractive mixes. .Three Leds monitor the amplitude of the three outputs (HP, Mix, LP). Looks great. Would love to hear a demo. Hopefully we'll have one in a few weeks! what's the BP/NP and NP/BP outputs? BandpPass and Notch or what? anyways, looks stellar as always! Does it mean it can be pinged with a triger like ÃƒÆ’Ã‚Â Lpg ? Any word on demos? 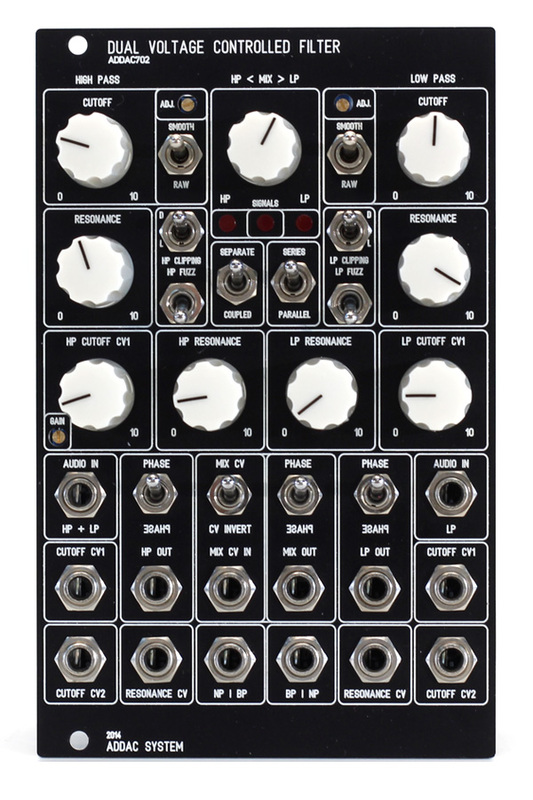 I'm keen to see how it compared to the intellijel one? Here are the new videos for ADDAC702! Please send me one ! The range of the resonance knobs seems a bit narrow, both filters go into self-oscillation at just under 50% resonance. I'm curious what the reason was for this choice? Is there a way to provide more range before self oscillation? I thought that when looking at these vids but it doesnt really concern me now i have my hands on one. .... Its just very interactive ... The cuttoff and res interact alot... And the three way diode switch also changes things up alot. I sent an email to ADDAC Systems regarding controlling the resonance behavior. Their response: "...the module features trimmers on the panel face that allow you to make this adjustment." That was all I needed to know! Now I'm on the waiting list for the next run. I just saw this on YT and thought I'd post it here as well. This filter is on my list for sure. I received this Filter a few days ago, and even if i haven't spent yet much time with it, i must say it meets all my expectations, and beyond. In a sense the demos on Addac's page are very informative, but they don't give a proper idea of the musicality off this thing. Maybe they don't do it justice. And the "resonance pot" drama may have biased opinions : it's in no way a crushing non sensical filter. Of course, the fuzz can bring any sound to a kind of angry rumble, but, much like an Analog heat, this fury can always be tamed, and underlines details in the source material. The high resonance is not a problem : I haven't trimmed my pots and i'm very happy with the way they are for now (with the self resonance occurring around 12 o'c.). I guess it's just the way to always have at your disposal a huge palette of harmonics to be added on top of your playing. The resonance peaks can be remove easily, but when they're here, they always seem to sing their own songs, on top of the rest. You have to try it to feel it, inside a patch. It's really tactile and physical, because each routings or diode clipping sculpts the sound in a new and dynamic way. I tend to see the 601 Filterbank as very "horizontal" filter : you draw the audio spectre with vertical resonating bands : the sound is large or thin, moving at the frontiers of the frequencies, or right in front in the middle range. Pairing the two makes a fascinating canvas of timbres! At least for me. Anyway i'm not sure if this prose is really pleasant and informative. I'm just a french living in Italy with a poor english... And maybe all my metaphors can't beat a proper demo vids. So sorry for it! I felt like, for one time, i should tell what i feel about a module, instead of reading your comments! I Anyway i'm not sure if this prose is really pleasant and informative. I'm just a french living in Italy with a poor english... And maybe all my metaphors can't beat a proper demo vids. So sorry for it! Your praise is like singing in my ears! Much appreciated.